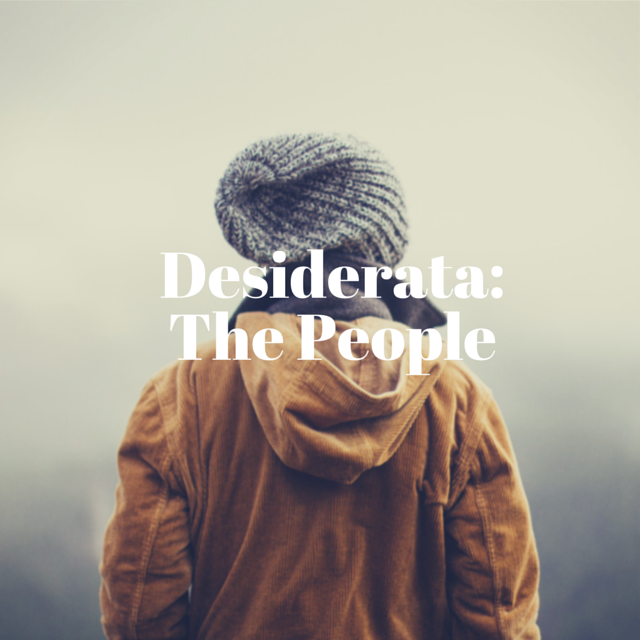 This is part two of Desiderata, a project that aims to share a glimpse of reality – what do students of Truman State University desire? Why do they do what they do? 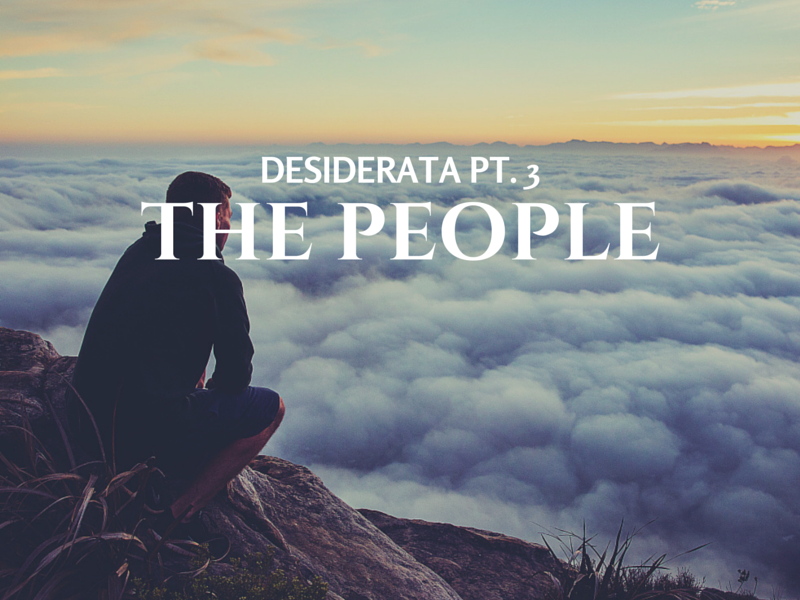 If you haven’t had the chance, check out our Desiderata video! While the video is a nice overview of what we discovered, we believe that there were many stories left unheard. In Part 2 and Part 3, we share two transcriptions of our actual conversations with internationals. To be satisfied and to have a peace a mind. To be happy with whatever or whoever I am in the future. I’ve seen a lot of complicated relationships and situations; just looking at how complicated human emotions are, I think in life it’s very important to have a peace of mind. I’m currently pursuing a minor in environmental studies. I plan to be low on my consumption, and just to desire less – from food to clothing. If you become an extreme environmentalist, you’d know that the world is very complex, and that you’re not supposed to be among the crowd and do things that are not good for the environment. For example, how people consume energy excessively and unnecessarily – this has been a trend for a long time, so to change that on a global level is a big challenge. I know that even if I try to do things that consume less energy, it will have a minimum effect on the environment; but at the very least, I want to be a part of that movement. I just came out from my bubble. Namaste Nepal is another organization I am a part of; it’s more than just a cultural organization. It’s like a part of you, you know – you’re away from home, but you meet people who have similar ideas and experiences as you do. Traveling. When you travel, it’s like the most refreshing and thrilling thing ever. I can’t think of a quote off the top of my head, but I’m a freak when it comes to commencement speeches. I love the one by Steve Jobs. I literally printed it out and have it in my room. His speech is an inspiration for me; just seeing how people struggle a lot, get through everything, and succeed in life. Utilize your time. Get involved. Even when there’s heaps of snow outside, just go out and get involved with anything possible. Meet a lot of people. 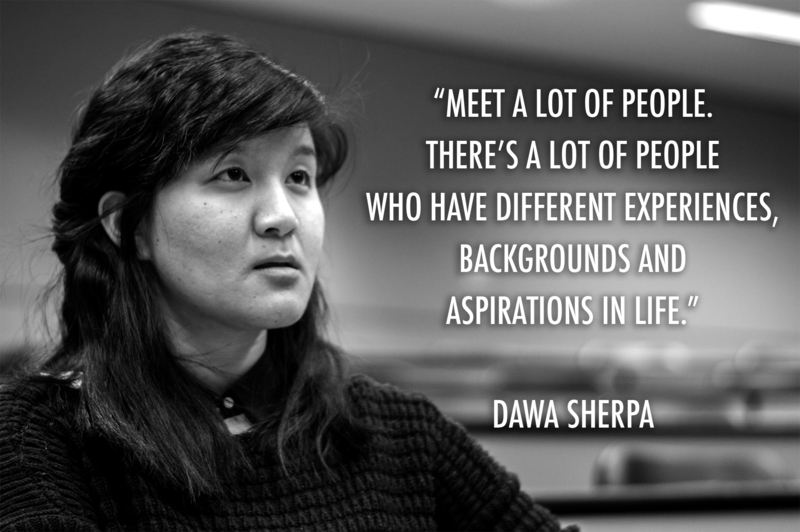 There’s a lot of people who have different experiences, backgrounds, and aspirations in life. Whatever it is, try to balance off and respect people’s views. That is one thing I learned from one of my close friends, and that was one quality she passed on to me. I want to be a helper. I want to offer help from academic assistance to all sorts of help. I like to read a lot of books, so I want to make reading books a habit more embraced by people because nowadays reading books is eroding and I don’t want that to continue to happen. This summer I’ll be going back to Vietnam, and I’m applying for an internship that provides academic help to underprivileged children. I’ve been reading and buying a lot of books. I will try to bring them to Vietnam, because in Vietnam the resources are not really plentiful, and I want to spread those resources to people around me. I believe in the butterfly effect; the little activities that we do can initiate a chain effect, which can either demolish or develop a lot of good things. So, I try to fulfil my place in the universe by doing as many good things as possible, and being appreciative of that status. I like the calm, serene, Midwestern lifestyle here; the climate and atmosphere keeps me calm, and help me reflect more on things around me. I’ve been meeting a lot of inspirational people, and they’ve really helped me in figuring out and achieving my desires and passions. The education in Truman is spectacular; never in my life have I met such inspiring teachers. Cosmos by Carl Sagan. 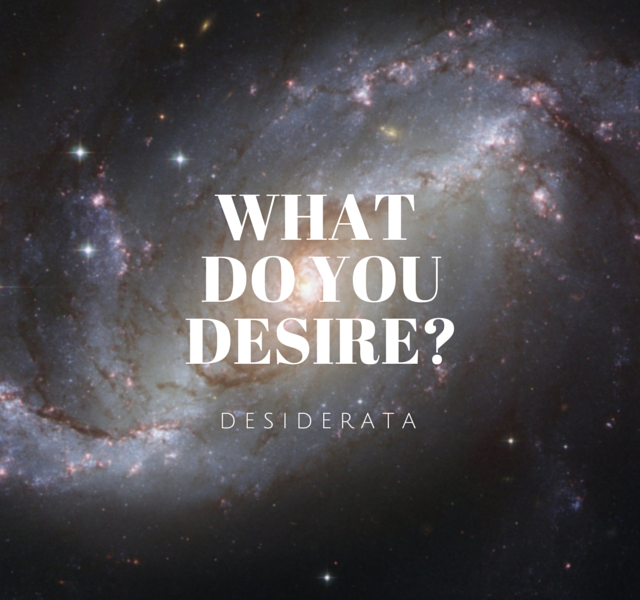 This book answers questions about astronomy, sciences, and what it means to be human – like a human in the universe. The book made me feel more appreciative of being human, and helped me better sympathize with people around me. One human being that really inspired me is my grandfather. He was a math teacher in Vietnam during an impoverished state of time, when people could not even afford to buy clothes, let alone afford a good education. He offered a lot of free tuition to people then, and some of them still constantly thank him for that. 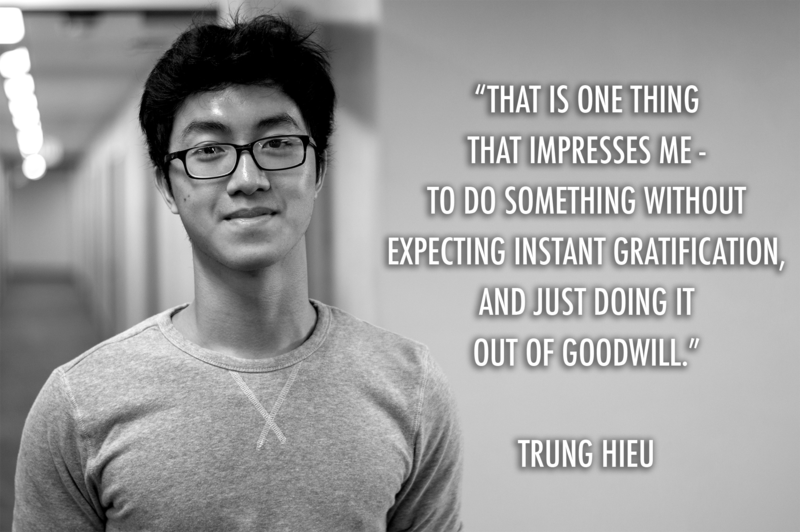 That is one thing that impresses me – to do something without expecting instant gratification, and just doing it out of goodwill. There’s a quote in the book Cosmos that I really enjoy: “Every one of us is, in the cosmic perspective, precious. If a human disagrees with you, let him live. In a hundred billion galaxies, you will not find another.” We are all unique, I think. I know a lot of people around my age who are confused about what they want in life. I personally think that not having a clue about what you want in life is not a problem at all. I’m glad I’m still in the process of figuring out what I want to do in life. My advice is to just carry on doing what you’re passionate about, talk to people, be alert of everything around you, and keep an open mind.